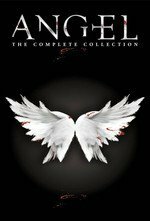 The only Joss Whedon-directed episode of the first season, the series premiere brings Angel (David Boreanaz) to Los Angeles, where he saves some girls from vampires and realizes that he's closer to turning bad than he'd like. Fortunately, Doyle (Glenn Quinn) is there as a representative of The Powers That Be to get Angel back on the right track. Cordelia plays the damsel in distress role, but gets a great moment where she realizes that her would-be sugar daddy is a vampire. We also meet (briefly) Lindsey McDonald and establish that Wolfram & Hart and its Senior Partners are the bad guys. Aw man, I always feel so bad rewatching Angel knowing how Glenn Quinn ended up. I remember really wondering if this show was going to work, and being iffy on the show for a long while. I think it was probably the second season when it started to get really good. I've said it before: Joss Whedon is not great at starting shows. He's great once a show gets going, but his pilots and first seasons can be pretty blah. It's funny how both Doyle and Kate Lockley were both supposed to be central parts of the show but then got written out early on. In both cases I gather it had more to do with actor complications than character problems, but I don't think either character totally worked and the show definitely got better after they were gone. Wesley seemed like a weird replacement for Doyle at first, this comedy relief twit leftover from Buffy, but he ultimately became maybe the darkest and most compelling character on Angel. I'm a little worried about participating in this discussion because I'm eight episodes away from finishing the series, but I guess I've already pretty much spoiled myself. This episode introduces The Powers That Be, a concept that I'm not sure I ever really loved or was completely consistent, which is too bad for a driving force of the series (unless it resolves perfectly in the last eight episodes). Wolfram and Hart, on the other hand, I found to be a better-realized and more interesting concept on the whole. Wesley seemed like a weird replacement for Doyle at first, this comedy relief twit leftover from Buffy, but he ultimately became maybe the darkest and most compelling character on Angel. This is so true. I started off thinking, "Wesley??" and now I think, "Wesley!!!" He's my favourite character in the series. I guess they were sort of trying to recreate the Whistler character from Buffy with Doyle, showing Angel is starting over and needs to be "saved" again, so to speak. Some of the dialogue is a bit dire in this one. I'm not sure the "Doyle says Angel needs to show that there's hope and love in the world and then immediately insults a homeless person asking for change" is as funny as it's supposed to be. Angel jumping into the wrong convertible is pretty funny, though. Really, anything involving Angel and cars is usually funny. I think the whole "Angel gets a movie producer's card though he swears he's not an actor" part is a decent callback to the fact that Boreanaz wasn't an an actor but was essentially discovered due to someone involved with Buffy casting seeing him out walking his dog. Cordelia is definitely a necessary breath of fresh air on the show. I like that she's still doing the hiding her poverty thing from the end of S3 of Buffy, for continuity. We know Angel's seen 14 wars via the dialogue. How many do we actually see in flashback, and what are the other ones? My understanding is that originally the Doyle character was supposed to be Whistler, but the actor was unavailable. A first draft script reveals that Angel was originally intended to include the character Whistler, played by Max Perlich, who had already been featured in two Buffy episodes, "Becoming, Part One" and "Part Two". In an interview, Perlich said, "I never got called again. If they had called, I would have probably accepted because it was a great experience and I think Joss is very original and talented." That's a bit surprising, and I could swear I read something where Whedon or somebody was saying they couldn't get Perlich. Assuming Perlich's telling the truth, I wonder what the thinking was there. The characters are very similar indeed, so why change it if you don't have to? The fact that it wasn't Perlich always made me sad. His work as Brodie on Homicide was always great.